Sales HUM – Hunger – Urgency – Motivation is all about how we go about our lives as salespeople. It’s about making that extra call after 5pm (or 6pm! ), it’s about doing that little bit extra for our clients and prospects, it’s about never accepting the first ‘no’ and it’s about keeping your sales antennae constantly active and always on the lookout for new opportunities! • Seek to add value to your customers & prospects? • Maintain positive body language at all times and constantly look for new opportunities? • Adopt an inquisitive approach borne out of genuine interest and desire to help? • Strive to be the best performer? • Give in at the first sign of ‘no’ and fail to follow up? • Try to show your expertise and impress people by banging on about your products? • Assume you’ve heard it all before and not listen to your customers? • Focus on the past and make excuses? 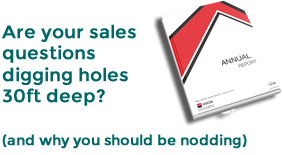 • Put off what you see as difficult sales tasks? It’s one of the easiest things in the world to tune out and stop listening to people. In today’s world we are bombarded by all sorts of distractions that makes focussing on our customers very challenging. But in sales, it’s all about them! Your customers don’t care about you, your products or what you do. They only care about what you can do for them, what benefit you can bring to their business. So, what does your Sales HUM sound like? Do you make people want to work with you? Do you act with honesty & integrity? Do you believe in yourself and focus on the customer? Tune in to your Sales HUM, you might be surprised what you hear!